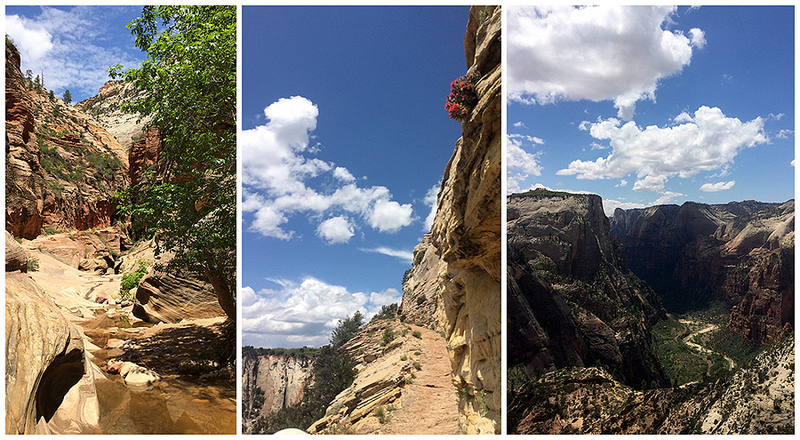 - On Tuesday we again lucked out as the weather finally broke over Zion National Park. 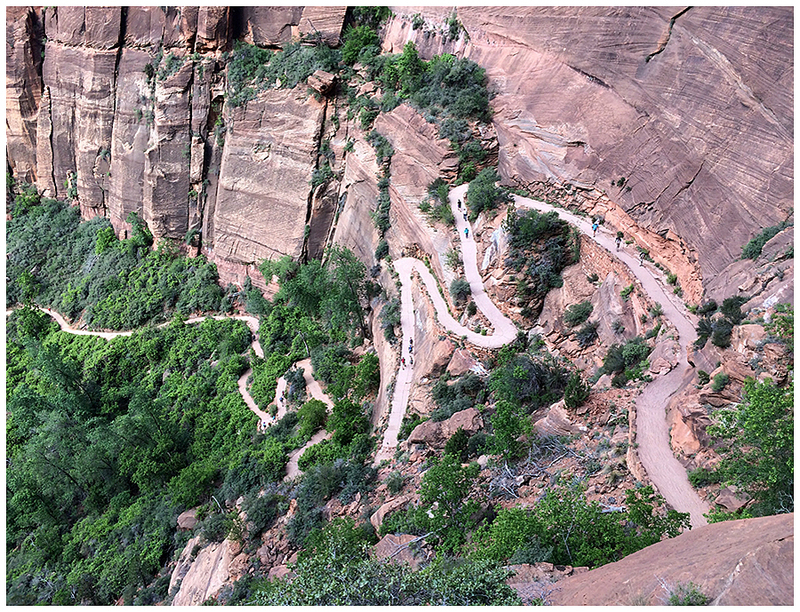 The ride into the park is really wild, you pass through a long tunnel then drive down into the canyon on a steep road with several hairpin switchbacks before bottoming out along the floor of the Canyon. Once again we got into the park before the rangers had set up at the entrance and got in for free! 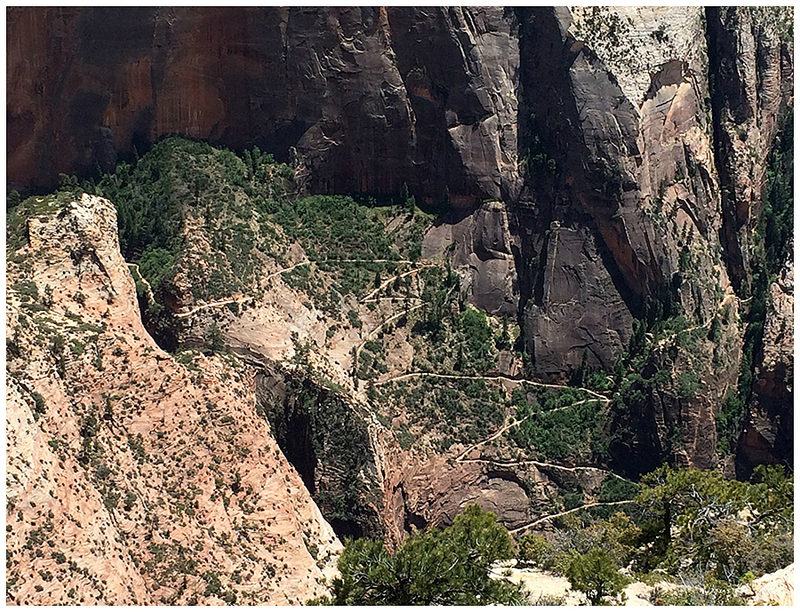 - Zion is a little different than the other parks we had visited, between March and October you have to take the free canyon shuttle bus to access the Scenic Drive area inside the canyon walls where the trails to the major hot spots are. 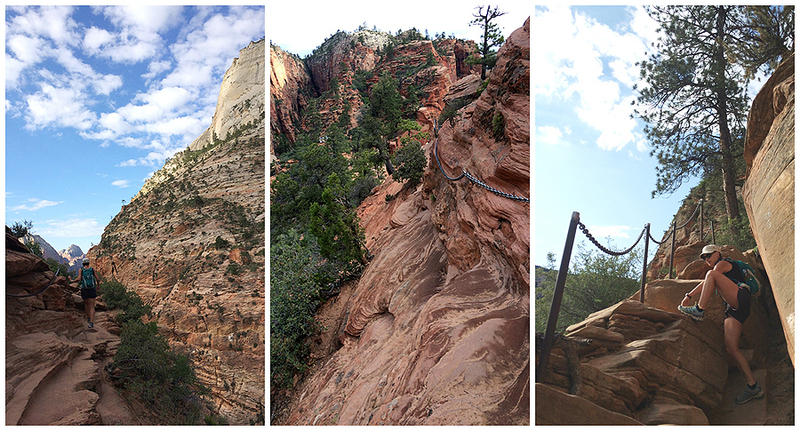 The two most popular spots are Angels Landing and the bottom of the Narrows. 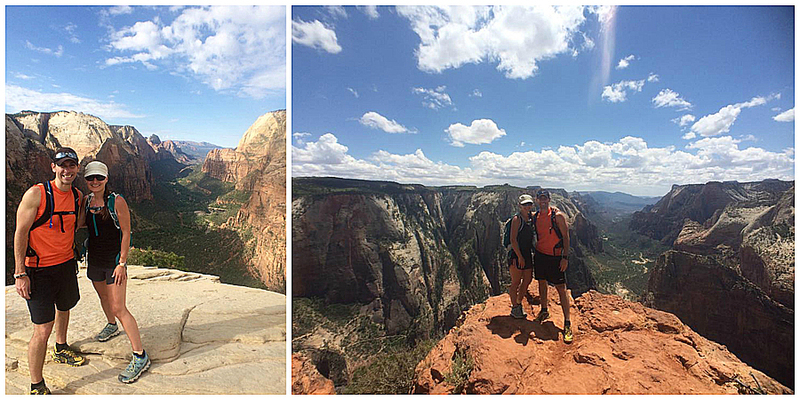 Our agenda for the morning was to beat feet and beat the crowds to Angels Landing. - As luck would have it we parked the Jeep at the visitor center and hopped right on the shuttle which took us to the Grotto where we jumped off and started the short but steep hike up several switchbacks to Scout Lookout and over to Angels Landing, which is described as follows; The route to Angels Landing involves travel along a steep, narrow ridge with support chains anchored intermittently along the route. Footing can be slippery even when the rock is dry. 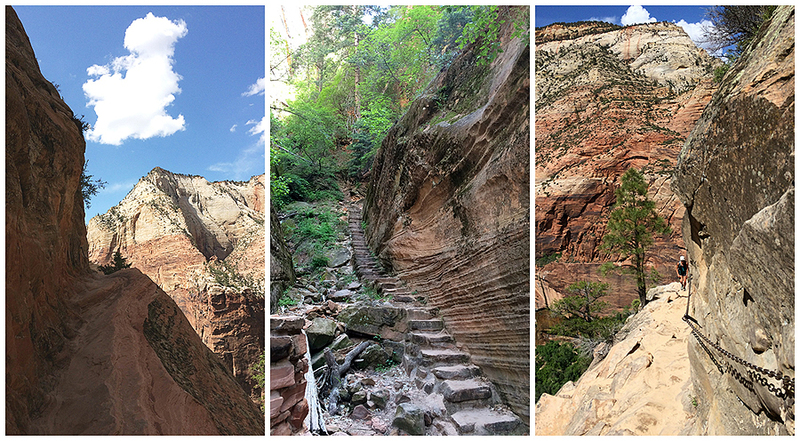 Unevenly surfaced steps are cut into the rock with major cliff dropoffs adjacent. - It's a pretty exhilarating hike and yes a fall would have gravely consequences, but having been on the Knife Edge on Mount Katahdin (no chains in Maine, man!) this was kind of minor league since every tricky section had chains to help for safe passage. 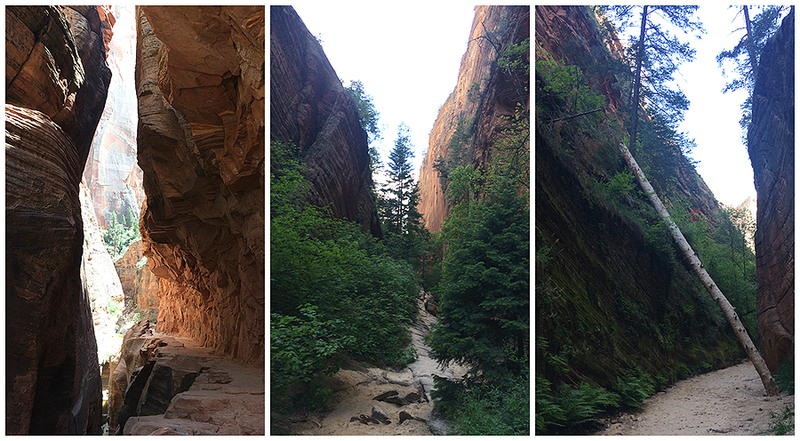 Within the first fifty feet my anxiety went from heightened to near zero levels as I felt comfortable navigating the narrow passage along the side of the red rock with the huge dropoffs. 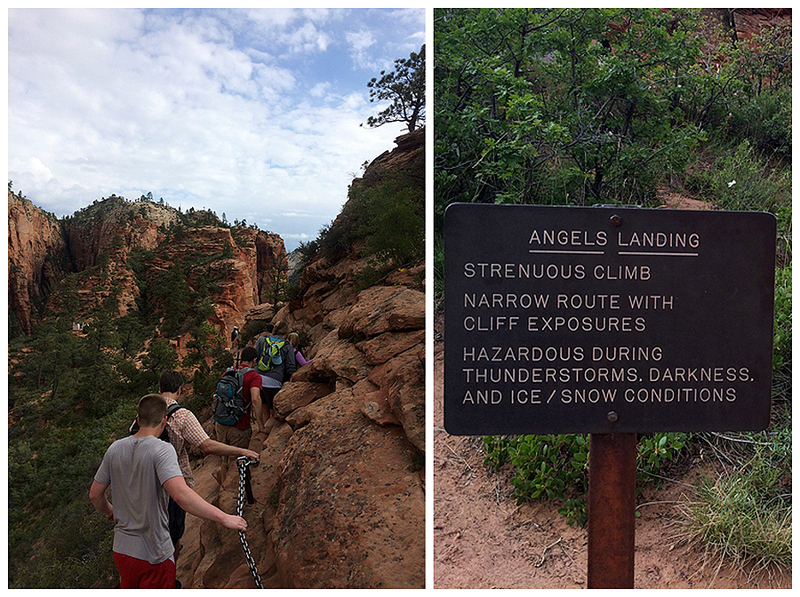 The only tricky part was navigating by slower hikers or hikers heading back from Angels Landing. 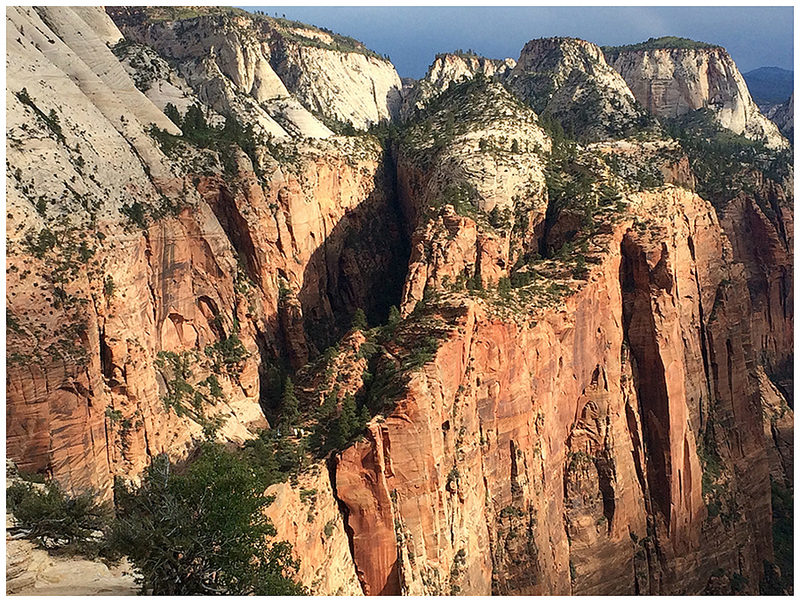 Once again as luck would have it (timing and luck were the theme of the day) we out hiked most of the tourists up from the Grotto (including one guy who tried his hardest to keep pace with us as he was coughing up a lung) to the 'scramble' along Angels Landing. 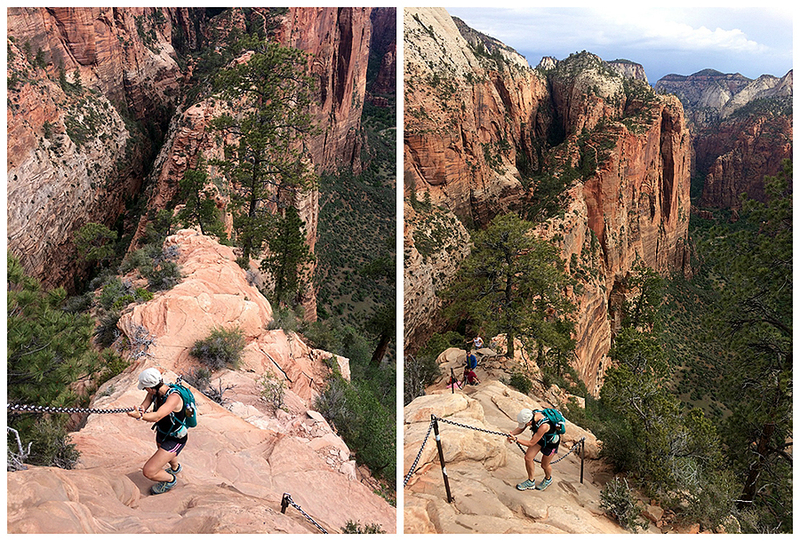 The hike across the landing was a relatively quiet one and we even got to enjoy Angels Landing Point with only a few other hikers and a couple of opportunistic chipmunks. 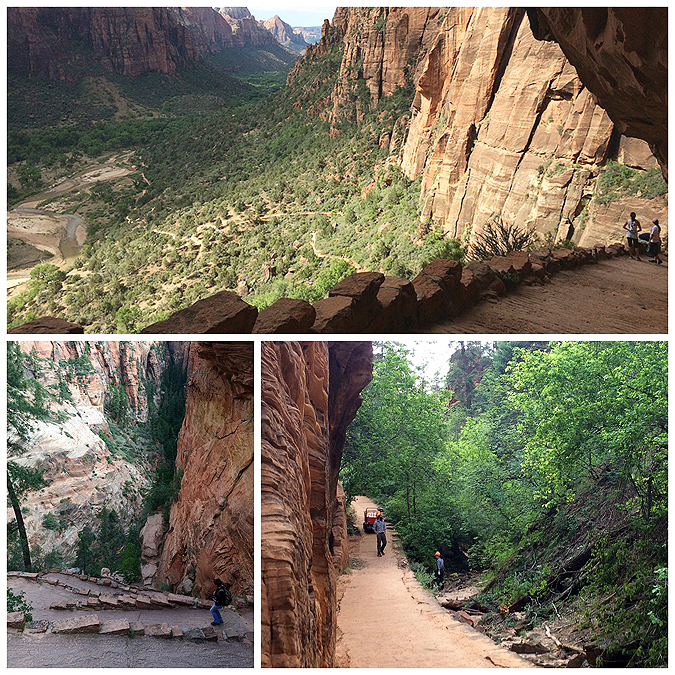 - After taking in the views, eating, and relaxing we turned around and hiked back across the landing as the crowds were starting to come through, but luckily we didn't hit a bottleneck until the last fifty feet! - From here we headed down the hairpin switchbacks to the Grotto, jumped on the shuttle to the visitor center to pick up our Narrows Permit for the following day, walked to Springdale (it's literally a stone throw away!) 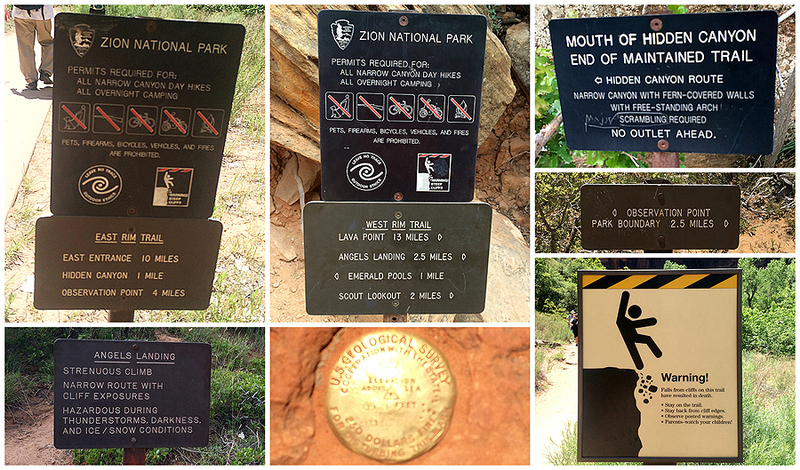 to reserve water shoes and a hiking staff for the river walk of the Narrows, and then plan out our afternoon hike. 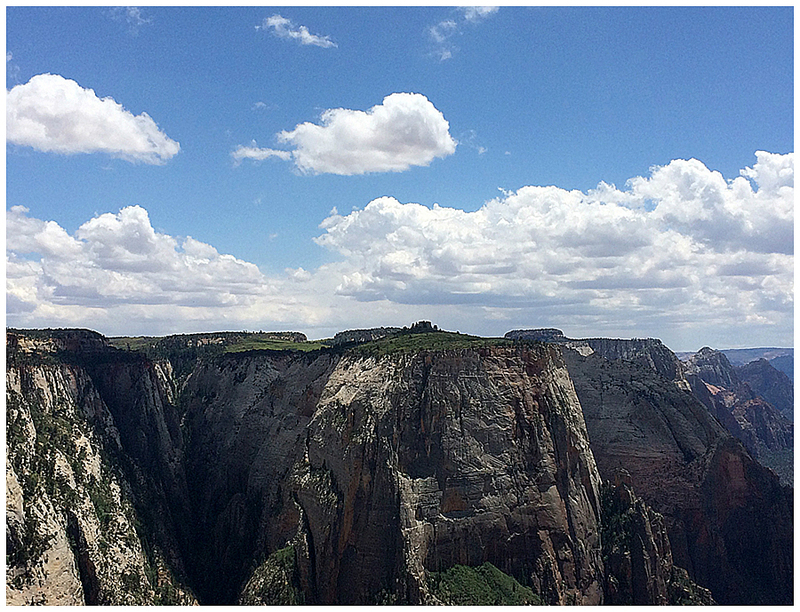 - Our second hike of the day, Observation Point, would take us across the canyon and high above Angles Landing. We took the shuttle back into the canyon to the Weeping Rock trailhead located near Big Bend. Most hikers were milling around heading to Weeping Rock so we were able to avoid a majority of the crowds as we were heading to a quieter and more strenuous destination. - The footing over the first mile was kind of strange as it seemed like we were hiking on an old concrete road, it could have been rock but I'm almost positive it was patchy concrete! 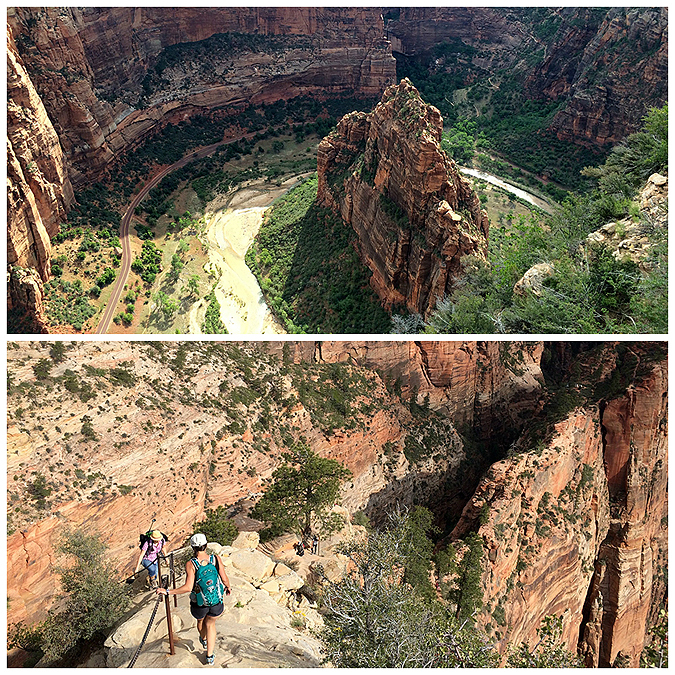 Anyway, the grades are easy to moderate and we made great time over to Observation Point where we had phenomenal views down into and out of the canyon. 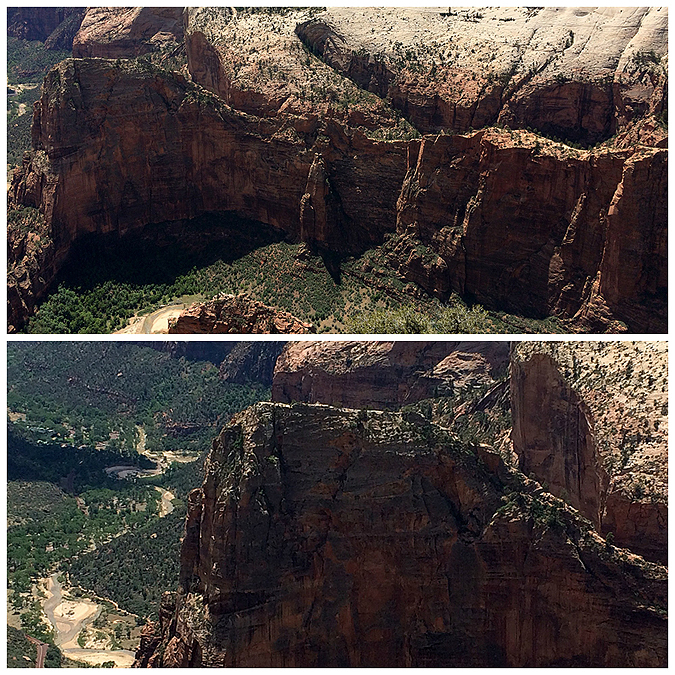 Observation Point is six hundred feet above Angels Landing which was across the way just south of Big Bend. 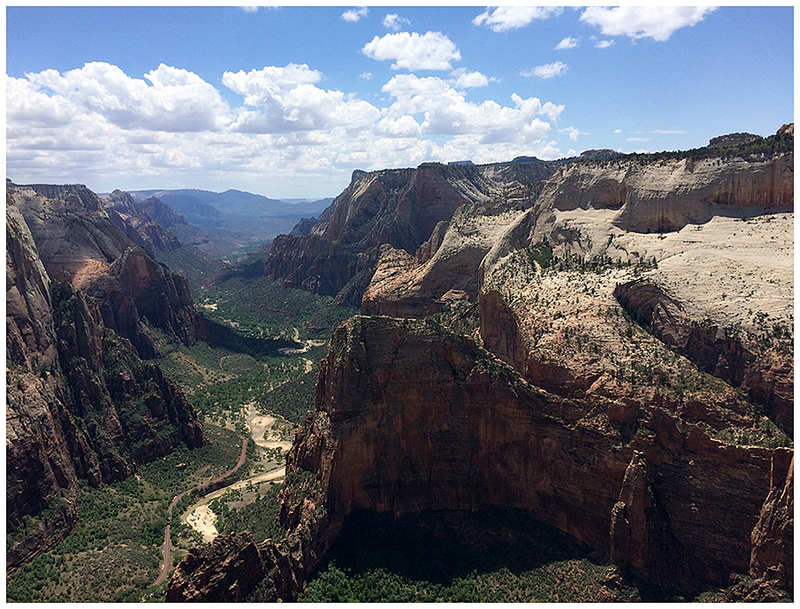 There were also great views out of the Canyon to the south as the steep walls rise up to the east and the west. 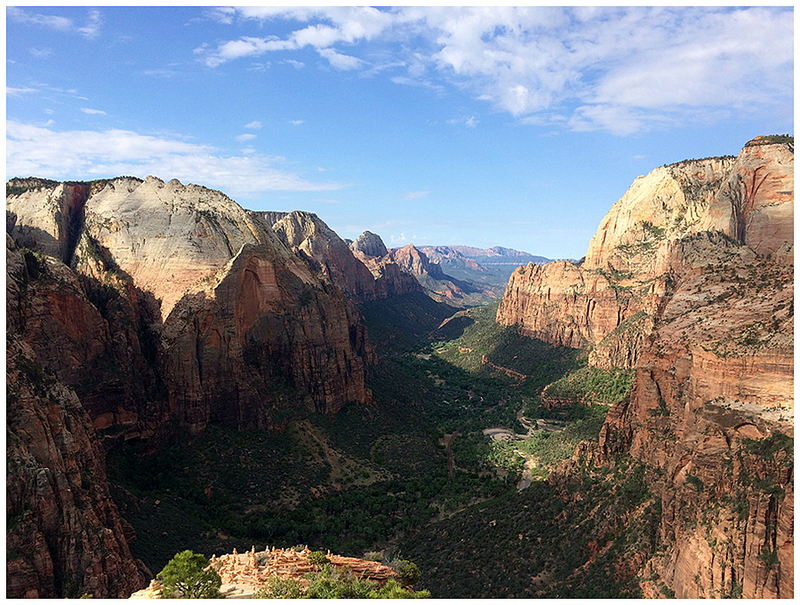 In my opinion it was a better view than what we had from Angels Landing because you could take more in from this higher elevation. 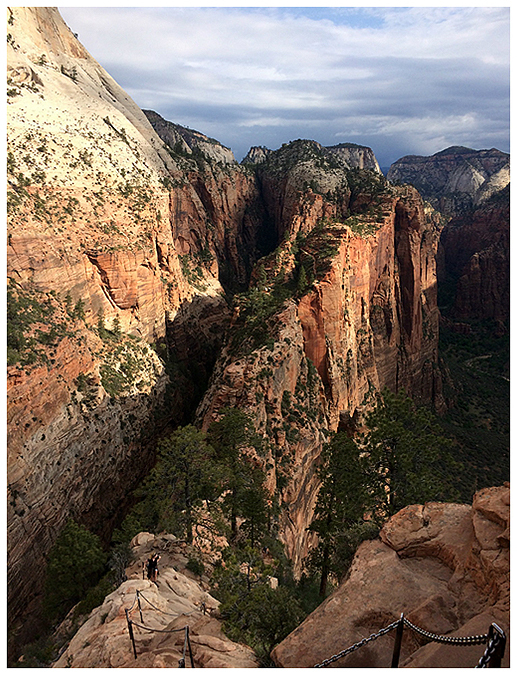 - We relaxed for a little bit on top of Observation Point, getting our picture taken, eating, staring out into the Canyon before quickly descending back down. On the descent we took a short detour into Hidden Canyon. The walk to the start of the slot canyon was pretty nice, there was a narrow section of trail with a big dropoff, there was even a couple of chain sections, (remember, no chains in Maine, man!) 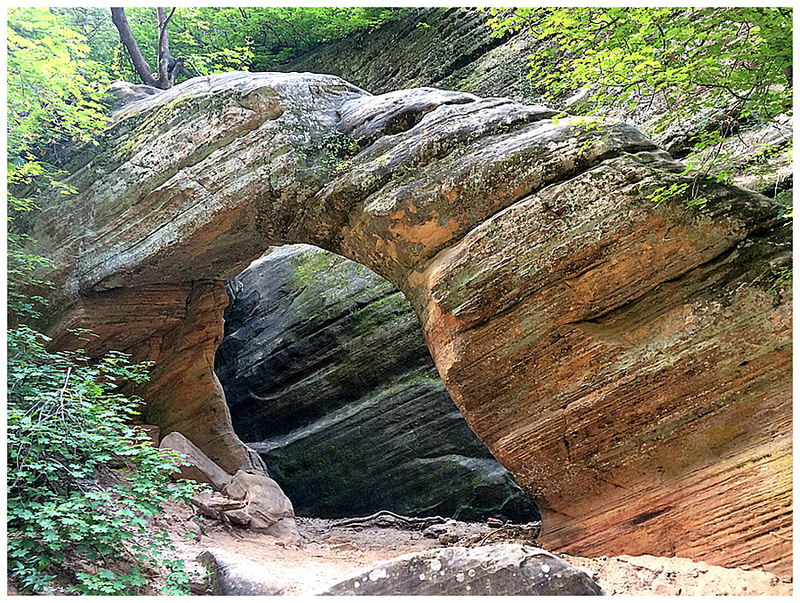 but the canyon itself was kind of lame, although it did have a really cool natural arch in it. 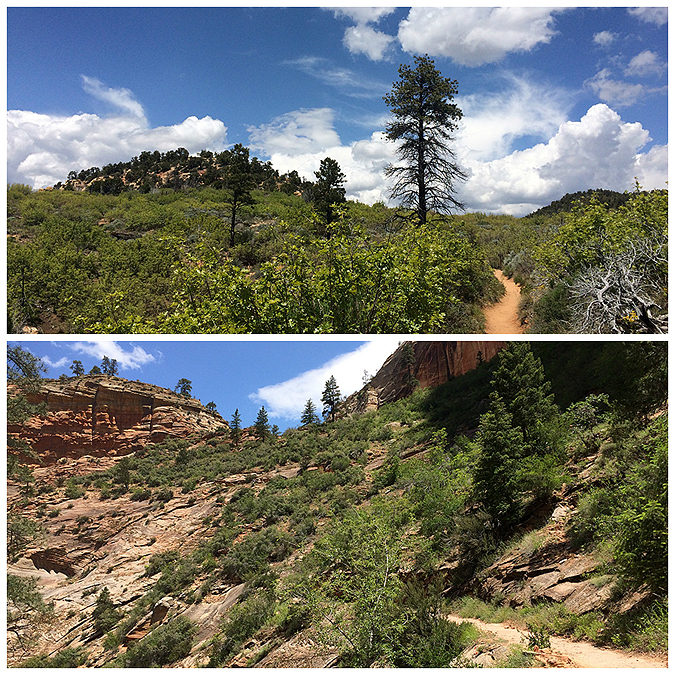 After traveling for about ten minutes along the bottom of the canyon it became apparent that there was no destination to be seen so we high tailed it back to the trail and eventually out to the trailhead. 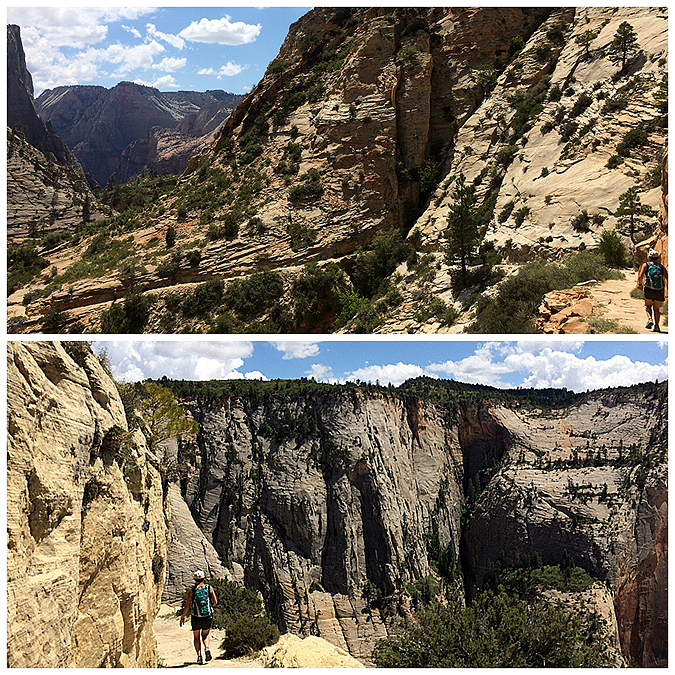 - From Big Bend we caught the next shuttle back to the visitor center, crossed the footbridge into Springdale, and picked up our gear for the following day, the grand finally, a hike of the Narrows - top to bottom! 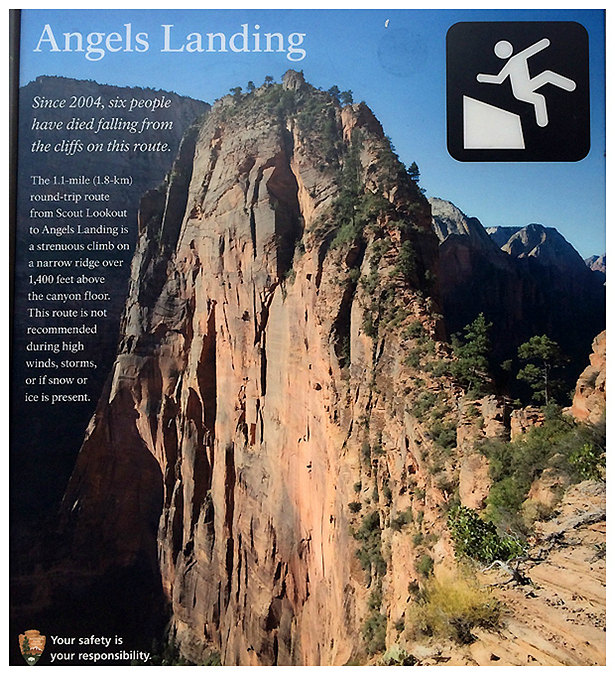 Angels Landing warning sign: Since 2004 six people have died falling from the cliffs on this route. 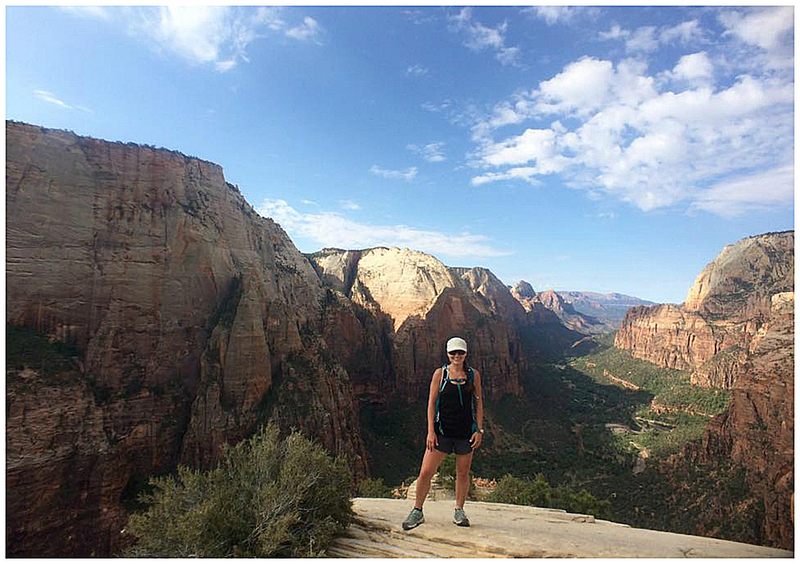 The 1.1 round-trip route from Scout Lookout to Angels Landing is a strenuous climb on a narrow ridge over 1,400 feet above the canyon floor. 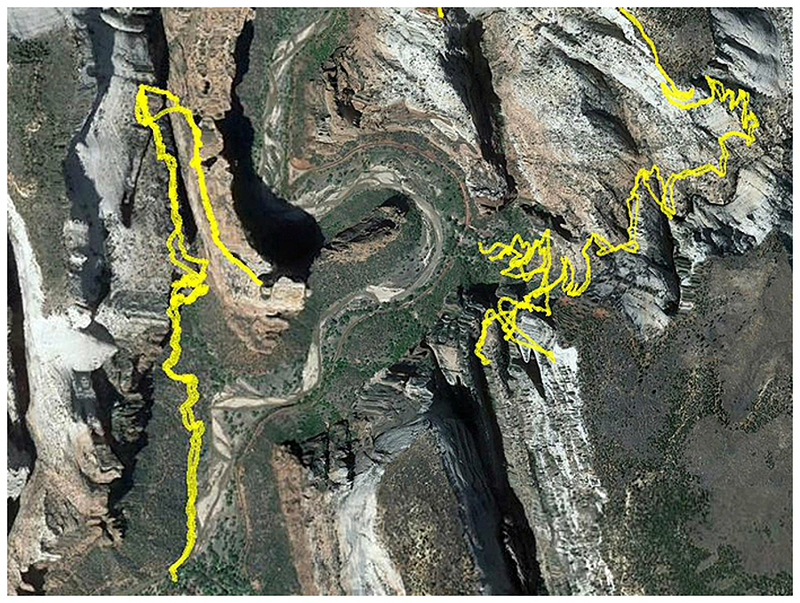 This route is not recommended during high winds, storms, or is snow or ice is present. Looking straight down to the Big Bend! Very narrow, very steep, very fun! From Observation Pint we saw a green plateau across the way with a stone formation. From our vantage point it resembled the Stonehenge. No idea if there is a way to get out there! Very informative post. 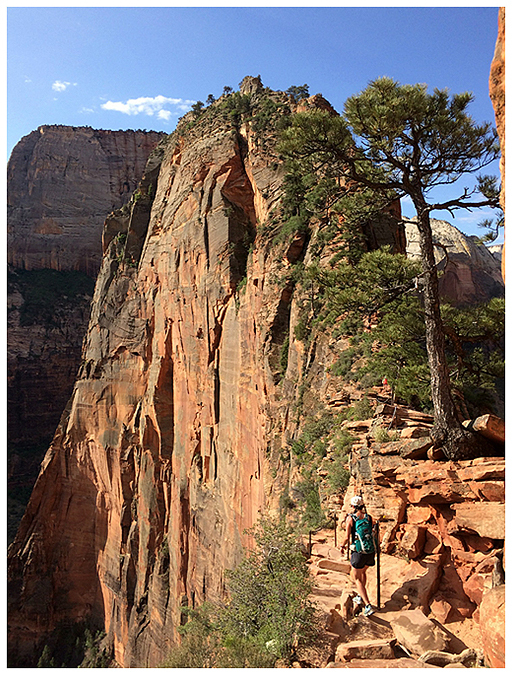 I am planning a trip to Zion with my wife in the near term and I have been looking for some photos throughout the Angels landing hike to show her that is doable. Thanks for sharing. Thanks, glad you found the\is post helpful. 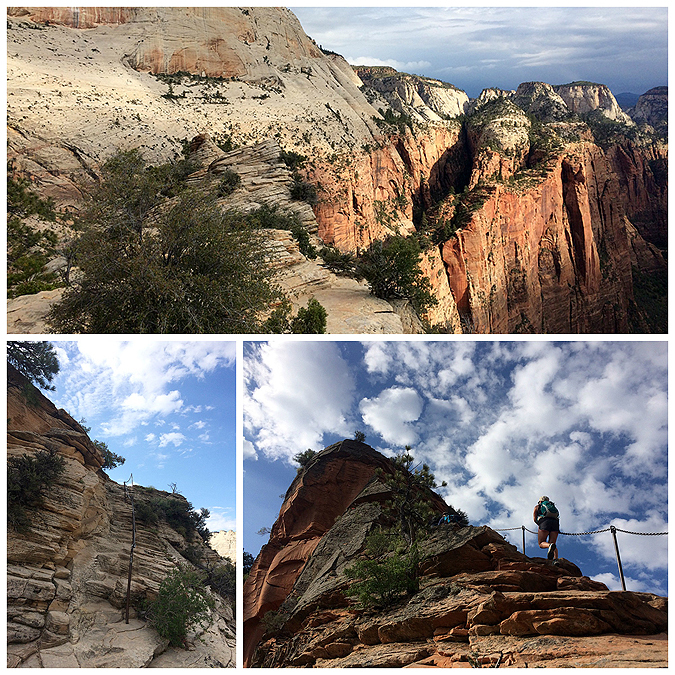 Angels Landing was very fun and exciting, it can get crowded so get there early if you can so you can enjoy it before the crowds move in. 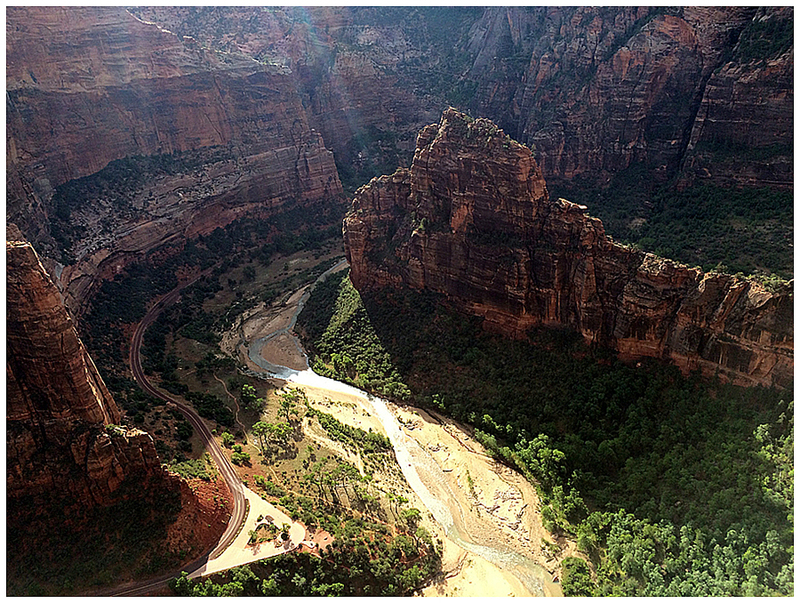 Zion was such a great experience, I hope I can get back there one day, hope you enjoy it too. 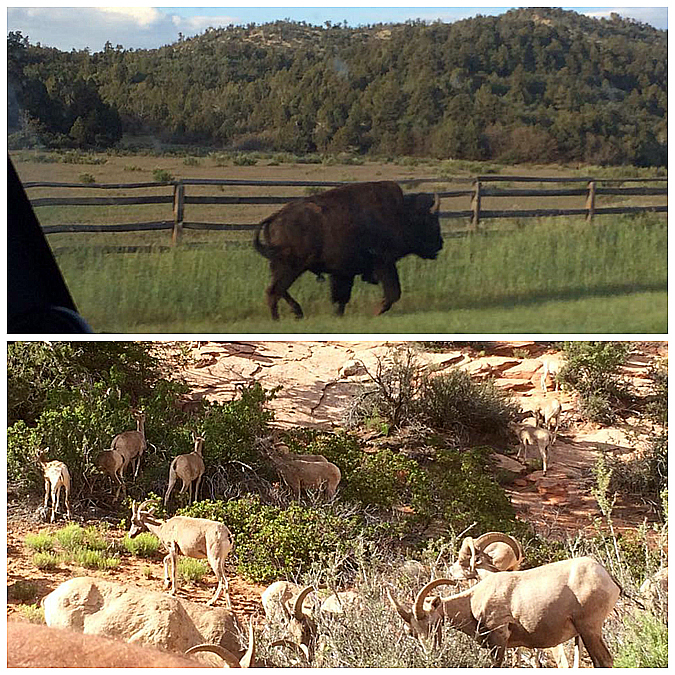 Check out Bryce Canyon too if you get a chance, wonderful place, out of this world! Thank you very much .This is really informative post.